The mighty Bears offense of 2013 was loaded with talent and set records to prove it. Coach Marc Trestman's Aerial Attack 1.0 gained the most yards and scored the second-most points in franchise history, sparking belief that the organization's identity was changing sides of the ball. Three seasons later, it's jarring to watch highlights of that team, given how far the offense has fallen, tied for 28th in the NFL in points last season. One by one, key pieces of that machine have been dismantled for one understandable reason or another. And when the Halas Hall doors closed Thursday behind Jay Cutler and Alshon Jeffery, the teardown was complete. While Cutler's release was an expected formality, losing Jeffery to the Eagles on a one-year deal reportedly worth $14 million exacerbates the Bears' need for playmakers, the same flaw that was so brutally exposed during last year 3-13 bellyflop. It raises the question: When Mike Glennon drops back to pass in Week 1 six months from now, who and what will he see as he goes through his progressions? Kevin White? Cameron Meredith? Markus Wheaton? Somebody — anybody — open? It's a conundrum general manager Ryan Pace and coach John Fox are familiar with, ironically enough, because Jeffery missed 11 games over the last two seasons. That, from the Bears' perspective, blocked the road to a long-term deal. Re-signing Jeffery was going to be a tough call for Pace from the moment the NFL announced on Nov. 14 it was suspending him four games for violating the league's policy on performance-enhancing drugs. When Jeffery was healthy and available in 2013 and 2014 — and playing alongside Brandon Marshall — he emerged as one of the NFL's top receivers. His long arms, strong hands and ability to make contested catches made him a security blanket for quarterback Jay Cutler. Making the Pro Bowl as an alternate in 2013 put a stamp on that promising season. But Jeffery missed seven games because of leg muscle injuries in 2015 and four to the suspension last season. During that span, both contract years, he averaged 53 receptions for 814 yards and three touchdowns. Meanwhile, the Bears suffered through games without him. So as Jeffery pushed toward the open market and the Bears fell to 3-13, their dynamic tilted toward him: The Bears needed Jeffery's playmaking ability as badly as ever, while he had leverage in searching for a team willing to bet on him. The Bears were interested in retaining Jeffery, 27, but only at a price that mitigated risk of his unavailability. As it turned out, Jeffery's market didn't develop to include the long-term deal he wanted. That he settled for a one-year deal elsewhere proved that a situation with clarity at quarterback appealed to him more than familiarity in Chicago. In a way, his departure resets the Bears receiving corps. It's now a ball of clay management can mold. At the NFL scouting combine on March 1, Fox explained what they want it to look like. "We didn't get long touchdowns and we weren't very good on third down," he said, reflecting on 2016. "Everybody highlights that we didn't score enough points, which is fact, but we didn't get a lot of long touchdowns either." Long touchdowns. As in speed. Deep speed. Jeffery wins jump balls deep, but running past cornerbacks is not his forte. Actually, that was the trait White was supposed to provide before breaking bones in his left leg twice over his first two seasons. The Bears remain hopeful he will in Year 3. But who else? Several other free-agent receivers reportedly or officially have found homes, including Kenny Stills (re-signed with the Dolphins), Kenny Britt (joining the Browns), Pierre Garcon (49ers), DeSean Jackson (Buccaneers), Robert Woods (Rams) and Torrey Smith (Eagles). The Bears did agree to terms with Wheaton, who stretched the field at times during his four years with the Steelers. But through Day 1 of free agency, the Bears have surrounded their new quarterback with a largely unproven receiving corps. The challenge of restoring the offense's potency is as daunting as ever. A team in need of playmakers is down one to start the year. Not many expected the Eagles to sign receiver Alshon Jeffery. Even fewer, if any, expected them to sign him to a one-year deal. That is exactly what happened on Thursday. The Eagles landing Jeffery, arguably the best receiver among the free agents, also seemed to come to a surprise to top personnel executive Howie Roseman. Speaking to the team's official website, Roseman said the Eagles didn't get serious with Jeffery until about 24 hours before the deal got done. "The opportunity came to us. We were looking at all of the options at our disposal to get guys who could potentially change the game," Roseman said. "Over the course of the last 24 hours, getting involved in his willingness and his agent's willingness to take a shot to come to come to Philly and to believe in the system we have in place and the people that we have in place, I think that's exciting for us." It is almost a deal that, at least according to Roseman, didn't happen as the team explored different players to sign. "I would say that, prior to 24 hours ago, we were probably stronger in a different direction, but things come to you and that's why you have to be flexible as free agency hits," Roseman said. "I think Alshon was always on our minds. It's just that the chance to make it happen was there. You never say never in this business." Jeffery, 27 years old, caught 52 passes for 821 yards and two touchdowns in 12 games last season. He stands 6-foot-4, 230 pounds. His unique blend of size and speed was expected to land him a huge deal on the free agency market. Instead, he signed just a one-year deal with the Eagles. "Certainly, when you look at the player's side, it's a chance for a player to go back into the market after one year after you've done really well. Our players get a lot of attention in Philly and when they play well they're going to get a lot of credit," Roseman said. "That's one of the draws that we have. In Alshon's case, I think it's an opportunity to show everybody the kind of player he is." The Eagles are hoping he can be the player he was at times in Chicago. If he is, the team might have finally found a player to pair with their franchise quarterback, Carson Wentz. Even if, for now, it is only for one season. 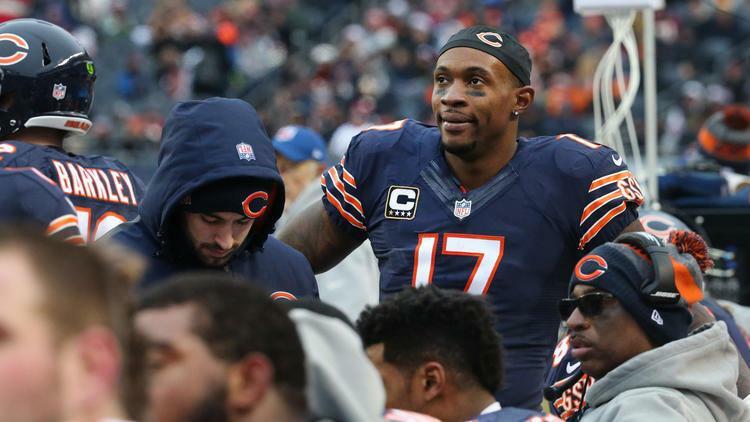 0 Response to "Alshon Jeffery's departure intensifies Bears' search for playmakers"